Diesel-powered high-speed cargo tractor built on the Ford F-750 chassis. The Eagle EB2-10 offers customers 10,000 lbf. DBP to tow up to 95,000 lbs. of cargo at 25 mph (40 kph) in typical operating conditions (Wet, 1% grade), and up to 65,000 lbs. of cargo in snow and ice. Eagle was the originator of the Bob Tail cargo tractor over 45 years ago, and still today the Eagle Bob Tail is the leader in high-speed cargo towing. In 1969, the genesis of today’s air cargo industry occurred. Eagle was there to answer the airlines’ call for an all-weather, high-speed cargo tractor which had not yet been invented. Eagle successfully engineered and developed the Ford F350 Bobtail for United Airlines at Detroit Metropolitan Airport. Within two decades, the Eagle Bobtail had become the narrow and wide-body cargo towing standard used by all North American and British Airlines. In the mid-1990’s, some cargo customers tried using industrial tractors, converted to high-speed use, as Bobtail replacements. However, by the early 2000’s the converted industrial tractors had demonstrated a track record of unreliability, and excessive driver fatigue and discomfort. Because of these problems with traditional tractors, the Eagle Bobtail Tractor has continued to thrive and is still the leader in high-speed, long-distance cargo towing today. Get a quote for bobtail tractors at Eagle Tugs today! Eagle Tugs was the originator of the Bob Tail design over 45 years ago. 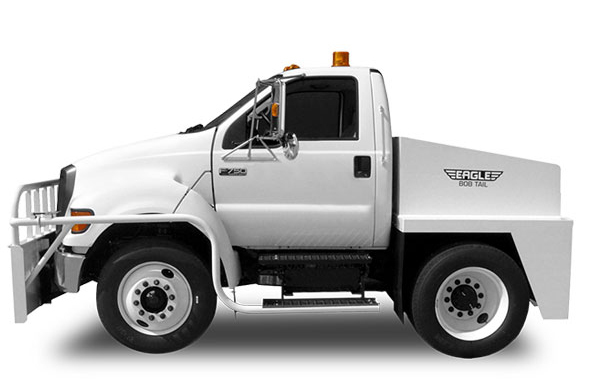 The Ford F750 Chassis has an unequaled, commercially-proven, reliable drive train and braking system. Power steering and braking, ventilated front and rear disc brakes, and heavy-duty wheels and radial tires. Ford cabs are ergonomic, comfortable and safe. Air Conditioning is standard (can be deleted upon request). Rear sight tunnel for direct hitch visibility for the operator. Heavy steel plate body and front & rear bumpers, including a heavy tubular grill guard and side protection. Powered by an emissions compliant Tier IV Cummins Diesel engine. Unparalleled reliability and factory-direct support is the Eagle Tugs advantage. Load Type Ideal for towing 5-6 cargo dollies long distances up to 25 mph in all weather conditions.